Maplewood is the combination of three neighborhoods. 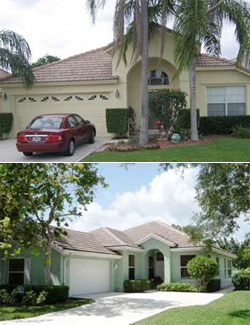 Stonebriar, The Hamptons and The Colony all make up Maplewood, centrally located in Jupiter. This Burg and Divosta development was built in the late eighties with poured concrete walls, tiled roofs and consist of single-family homes on green lots, lovely community lakes and lush tropical landscaping. Maplewood is close the Jupiter’s pristine beaches, fine dinning, great shopping and I-95 which can have you in Palm Beach Gardens or West Palm Beach in just minutes. Stonebriar at Maplewood in Jupiter, Florida is a gated community of 97 single-family homes, Stonebriar offers a community pool and tennis courts. Homes range in size from cozy two bedroom 1,500 sq. ft to larger four bedroom 2,500 sq. ft. homes. The Hamptons at Maplewood offers single family homes with 10′ ceilings. All homes are three bedroom, two baths with 1,900 sq. ft. The grounds provide for waterways and lush landscaping. Some homes have private pools. The Colony at Maplewood offers Key West style homes with small yards and no thru streets as a privacy benefit, and encompasses old world charm with Jones Creek babbling through the back of the development. The Colony offers a private community park that is appreciated by all. If you are looking to buy or sell a home in Maplewood or any of the other great Jupiter area communities, please give Preferred Residential Properties a call at (561) 747-8987.